Rick Platt: Can the 3D-Printed, Driverless Car Be Upon Us? Can the 3D-Printed, Driverless Car Be Upon Us? I love it when my issues converge like they sort of did recently. 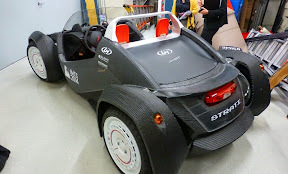 This is Strati, a car printed live at the International Manufacturing Technology Show in Chicago last week. In 44 hours, this car was printed using a carbon fiber reinforced plastic material. It was drivable at the IMTS show too. The Washington Post has an online report on it. It makes you wonder, how long before 3D printers can spit out easy-to-assemble cars? How long, also, before that technology converges with driverless car technology? They really do make sense together--lightweight, easy-to-assemble, driverless cars. I've written at length about 3D printing and, even, went about bringing it to Licking County for all to see at our science museum. Our Port Authority sold a site that attracted a company, xperion, that engages in use of carbon fiber for lightweight manufacturing. Lastly, I've pondered driverless cars and Ohio's capabilities in that arena. Could Ohio be where all these technology advances converge? Stay tuned.